SEATTLE (AP) — First lady Michelle Obama is on a mission to make American school lunches healthier by replacing greasy pizza and french fries with whole grains, low fat protein, fresh fruit and vegetables. 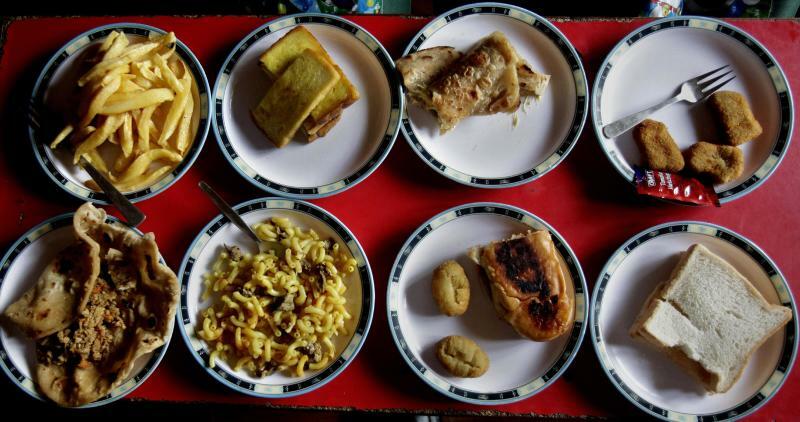 The Associated Press helps you compare her efforts in the United States with what kids are eating around the globe by sending photographers to see what kids in Asia, Europe, Africa and Latin America ate for lunch this week. The new American standards are giving kids in the United States a taste of the good life already experienced by school children around the world. Most countries put a premium on feeding school children a healthy meal at lunchtime. Many kids go home to eat lunch with their families or bring a lunch cooked by their parents. Although few schools sell lunch, snacks are available around the world. In many places those snacks are as unhealthy as treats in the United States: fried doughnuts in Mali and Pakistan, candy in the West Bank, fried chicken nuggets in France. American children are more likely to eat a lunch made in a school cafeteria, although other countries are starting to adopt this practice as more mothers go to work outside the home. In France, lunch is an art form: hot, multi-course and involving vegetables. While their mothers were at work Tuesday, children in Lambersart in northern France were served ratatouille, salmon, rice, a chunk of baguette and an orange. Healthy lunches are offered in public school cafeterias in the United Arab Emirates but the children of foreigners attending private schools get fancier, multi-cultural offerings like American barbecue, Indian curries and Asian noodles. Cuba provides all students with free school lunches, typically featuring rice, beans, another source of protein like a hard-boiled egg, a vegetable such as a sliced tomato and arroz con leche for dessert. Many parents send their children off to school with extra vegetables or a piece of fish or chicken to complement the free lunch. Fresh food is also on the menu at the DEL-Care Edu Center in downtown Singapore, where students are fed breakfast, lunch and even dinner if their parents work late. Typical lunches include spaghetti marinara, fish slices, chicken casserole or lotus root soup. Kids usually bring a home-cooked meal to school in Pakistan, where school leaders check lunch boxes for junk food and admonish parents to keep things healthy. A typical sack lunch at The Bahria Foundation school in Rawalpindi, adjacent to the capital, Islamabad, includes eggs, chicken nuggets, bread, rice or noodles. Some also include leftovers such as minced mutton and vegetables cooked the night before. Ecuadorean children bring sack lunches to school, typically a sandwich, juice, yogurt, cookies and piece of fruit. In Federal Way, Washington, schools have embraced the first lady’s lunch campaign for the approximately 16,000 children who get a school-made lunch each day. At Mirror Lake Elementary, about 20 miles south of Seattle, students ate grilled cheese sandwiches, corn salad, fresh carrots, apple sauce and low-fat milk on Monday. The bread was whole grain, the cheese low fat and low sodium, the carrots fresh and fruit the only dessert. Fried food, white bread, sugar-laden desserts and overcooked vegetables have all but disappeared from the American school menu. Anything kids can pick up with their fingers is popular in the younger grades. High school students enjoy some spicy and exotic choices, especially Asian flavors, says Federal Way chef and dietitian Adam Pazder. AP reporters Ali Akbar Dareini in Tehran, Iran, Baba Ahmed in Bamako, Mali, Zeina Karam in Beirut, Lebanon, Josef Federman in Jerusalem, Israel, Sameer Yacoub in Baghdad, Iraq, Nasser Nasser in Ramallah, West Bank, Adam Schreck in Dubai, United Arab Emirates, Angela Charlton in Paris and Anjum Naveed in Rawalpindi, Pakistan, Delores Ochoa from Ecuador, and photographers Wong Maye-E in Singapore and Franklin Reyes in Havana, Cuba, contributed to this story.